721d. Longo, Mildred Santille. PICTURE POSTCARD VIEWS OF RHODE ISLAND LIGHTHOUSES AND BEACONS TOGETHER WITHA BRIEF HISTORY OF LIFESAVING STATIONS. 1990. Rhode Island . 100p. Soft wraps. 8VO. Color illustrated covers. Chock FULL of vintage photographs, engravings, postcard views, Notice to Mariners and other illustrations, this work is a delight to read and to look through. With a chapter on each Rhode Island light station and light-vessel, this interesting work provides views and tid-bits of information not found in most volumes. Also includes chapters on Point Judith Life-Saving Station and the Volunteer Lifesaving Corps. Regardless of where you are from, you are sure to find this most interesting. Out of print, difficult to find. (VG+). $56. 2183. Claflin, James W., LIGHTHOUSES AND LIFE SAVING ALONG THE CONNECTICUT AND RHODE ISLAND COAST. 228p. 200 vintage photographs. Published as part of the Images of America series by Arcadia Publishing. 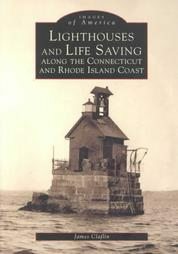 This is the third volume in a series of photographic histories of lighthouses and lifesaving along the coasts of the United States. Included too is a section covering the US Revenue Cutter Service and the subsequent formation of the Coast Guard, all illustrated with wonderful vintage views. Arcadia is a well known publisher of local and regional histories, including the popular Images of America series. This compact volume features over 200 early photographs dating from the 1870's through the 1940's, drawn from my and other private collections, most never before published and traces the history of these services through photos and text. (M) $19.99. 20178. [Light-House District Maps]. U. S. Light-House Service. c. 1900-1908. 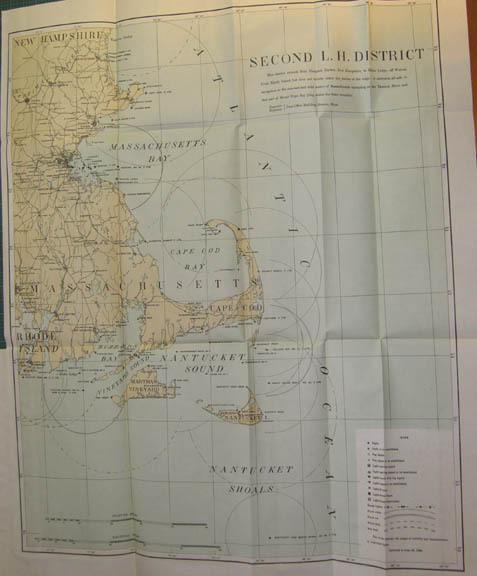 A rare opportunity to obtain early, official U. S. Light-House Service District charts of all district aids to navigation as bound in their Annual Reports. Normally these charts are included within the Annual Reports and we are unable to offer them separately but we have found a lot of disbound charts in wonderful condition. These are perfect for matting and framing for your wall. Charts detail the entire Light-House District in three colors, and show all lighthouses, beacons, light vessels, fog signals, lighted buoys, Light-House Depots, and more. Charts average about 9" x 10 ½" in size with one original fold and are clean and crisp. A rare chance to obtain the chart of your Light-House District for framing. (VG). 29142. Holmes, Richard. 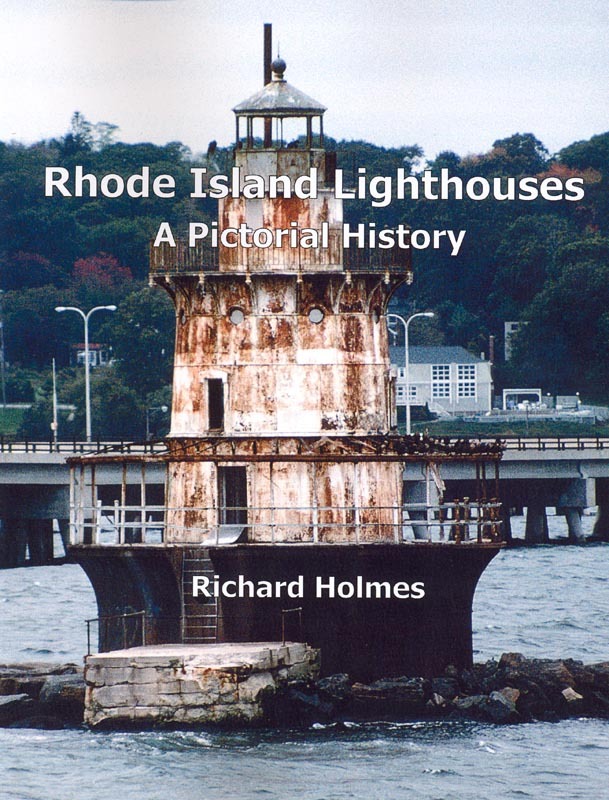 RHODE ISLAND LIGHTHOUSES – A Pictorial History. 2008. 212p. Soft wraps. 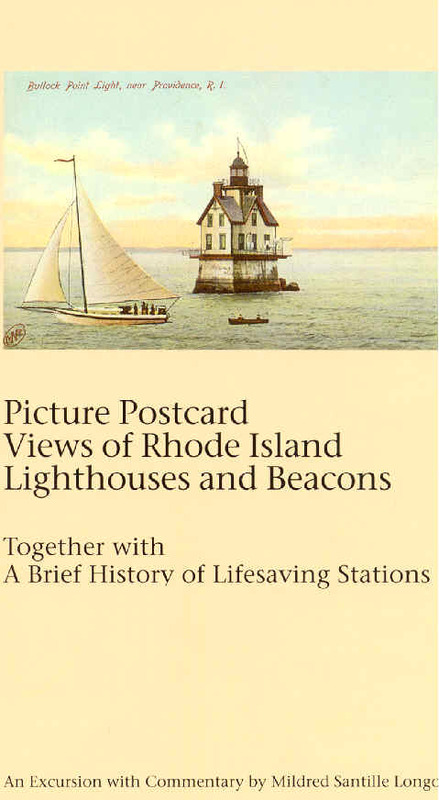 A complete pictorial guide of the past and present Rhode Island light stations, with vintage photographs, prints and postcard views and a brief history and description of each. With hundreds of illustrations. (M). $24.95. 24367b na. FIRST ANNUAL REPORT OF THE UNITED STATES LIFE SAVING CORPS IN RHODE ISLAND, MADE TO THE GENERAL ASSEMBLY AT ITS JANUARY SESSION, 1906. Providence . 1906. 36 p. Soft wraps. Illustrated with photos. The U. S. Volunteer Life-Saving Corps. existed in a number of states and was an early supplement to the U. S. Life-Saving Service in some areas, manning lifeboats and providing life-saving services on the coast and on inland waters. The Service maintained branches in 15 states where there were no stations of the Government Life-Saving Service or the Humane Society. States where stations existed include New York , Massachusetts , Rhode Island , Connecticut , New Jersey , Pennsylvania , Ohio , Michigan , Illinois , Missouri , Wisconsin , Indiana , Delaware , Maryland , and California . Information and awards of this service are exceptionally scarce and this has become an interesting collection area. Offered is an interesting early report which includes names of organization members and their Rhode Island locations (Edgewood Yacht Club, Pawtuxet, Shawomet Beach, Phillipsdale, Esmond, Moswansicut, Woonsocket, Crescent (Amusement) Park, Olneyville, Blackamore Pond, Newport, Bristol, Rocky Point (Amusement Park), Block Island, Quonochontaug, Narragansett Pier, Warren, Mashpaug Pond, Edgewood Beach, Riverside, Lower Harbor, Greystone). Also included is the general report, first aid and drill work, efficiency, a report of an aged couple rescue of a swimmer from the sea, expenses, awards of rescue medals, inspection of apparatus, placing the apparatus and demonstrations, examination for membership, general explanation and methods recommended, resuscitation rules, and many very interesting instances of rescues performed. Scarce report on this little known organization. Clean, complete, unusually nice copy. Scarce first report. (VG+). $95. 24367d na. FIRST ANNUAL REPORT OF THE UNITED STATES LIFE SAVING CORPS IN RHODE ISLAND, MADE TO THE GENERAL ASSEMBLY AT ITS JANUARY SESSION, 1906. Providence . 1906. 36 p. Soft wraps. Illustrated with photos. The U. S. Volunteer Life-Saving Corps. existed in a number of states and was an early supplement to the U. S. Life-Saving Service in some areas, manning lifeboats and providing life-saving services on the coast and on inland waters. The Service maintained branches in 15 states where there were no stations of the Government Life-Saving Service or the Humane Society. States where stations existed include New York , Massachusetts , Rhode Island , Connecticut , New Jersey , Pennsylvania , Ohio , Michigan , Illinois , Missouri , Wisconsin , Indiana , Delaware , Maryland , and California . Information and awards of this service are exceptionally scarce and this has become an interesting collection area. Offered is an interesting early report which includes names of organization members and their Rhode Island locations (Edgewood Yacht Club, Pawtuxet, Shawomet Beach, Phillipsdale, Esmond, Moswansicut, Woonsocket, Crescent (Amusement) Park, Olneyville, Blackamore Pond, Newport, Bristol, Rocky Point (Amusement Park), Block Island, Quonochontaug, Narragansett Pier, Warren, Mashpaug Pond, Edgewood Beach, Riverside, Lower Harbor, Greystone). Also included is the general report, first aid and drill work, efficiency, a report of an aged couple rescue of a swimmer from the sea, expenses, awards of rescue medals, inspection of apparatus, placing the apparatus and demonstrations, examination for membership, general explanation and methods recommended, resuscitation rules, and many very interesting instances of rescues performed. Scarce report on this little known organization. Clean, complete, light wear. Scarce first report. (VG). $85. 24367c na. SECOND ANNUAL REPORT OF THE UNITED STATES LIFE SAVING CORPS IN RHODE ISLAND, MADE TO THE GENERAL ASSEMBLY AT ITS JANUARY SESSION, 1907. Providence . 1907. 60 p. Soft wraps. Illustrated with wonderful photos of stations and equipment. The U. S. Volunteer Life-Saving Corps. existed in a number of states and was an early supplement to the U. S. Life-Saving Service in some areas, manning lifeboats and providing life-saving services on the coast and on inland waters. The Service maintained branches in 15 states where there were no stations of the Government Life-Saving Service or the Humane Society. States where stations existed include New York , Massachusetts , Rhode Island , Connecticut , New Jersey , Pennsylvania , Ohio , Michigan , Illinois , Missouri , Wisconsin , Indiana , Delaware , Maryland , and California . Information and awards of this service are exceptionally scarce and this has become an interesting collection area. Offered is an interesting early report which includes names of organization members and their Rhode Island locations (Edgewood Yacht Club, Pawtuxet, Shawomet Beach, Phillipsdale, Esmond, Moswansicut, Woonsocket, Crescent (Amusement) Park, Olneyville, Blackamore Pond, Newport, Bristol, Rocky Point (Amusement Park), Block Island, Quonochontaug, Narragansett Pier, Warren, Mashpaug Pond, Edgewood Beach, Riverside, Lower Harbor, Greystone). Also included is the general report, first aid and drill work, efficiency, a report of an aged couple rescue of a swimmer from the sea, expenses, awards of rescue medals, inspection of apparatus, placing the apparatus and demonstrations, examination for membership, general explanation and methods recommended, resuscitation rules, and many very interesting instances of rescues performed. Scarce report on this little known organization. Clean, complete, unusually nice copy. Scarce second report. (VG+). $95. 22361a. Block Island Coast Guard Station, Officer in Charge, South East Lighthouse cachet, Postmarked March 30, 1983. $28. 21462b. Benson, Frederick. RESEARCH, REFLECTION AND RECOLLECTIONS OF BLOCK ISLAND. Westerly. 1977. 1st edition. 147p. Signed by the author. 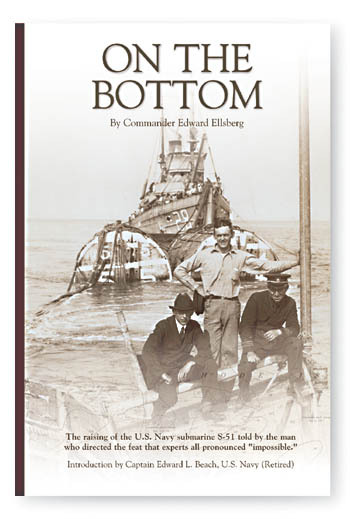 Truly captivating 147-page volume was written by local legend and life long Block Island resident Frederick Benson. Fascinating work offers an insightful look at the rich maritime history of this little island located off the coast of Rhode Island, in Long Island Sound. 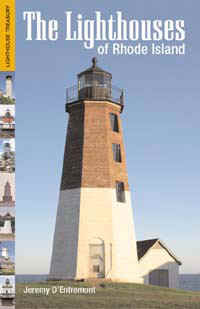 Detailed chapters include Block Island Harbors, Block Island Natives, Rhode Island Wrecks (Cruel Points and Reefs along Ocean Bay and Island Tales of Disasters, Origin of the Storms, Grounding of The Princess Augustus, Wreck of the Ship Ann and Hope, The Warrior, A-124, The Sprigg Carroll, The Steamer New Shoreham, The Brigatine Plover, Loss of the Schooner Percy, Wreck of the Vamoose, Wreck of the Tug Boat Leyden, Sinking of the Dubois, Wreck of the Steamer Spartan, Sinking of the Larchmont, etc. ), Block Island Lighthouses (Lifesaving Stations, Block Island Wrecking Co., etc. ), The Seiners, The Rise of Tourism and Hotel Life on Block Island (Prohibition and before Rum Running Days, Mail Transportation to Block Island, R.I., etc. ), Block Island Climate, Size and Other Information (Hurricane at Block Island, etc. ), Water Works in the Town of New Shoreham (Postmaster Nicholas W. Ball, From Cable to Telephone to Microwave, The Block Island Electric Lighting and Transportation Co., The Gristmill and Waterwheel on Block Island, The Wireless Station, etc.) and The Seaman's Belief (Nautical Terms, etc.). Clean, tight volume, as new. (F). $68. 6375. Henry, Joseph. A SUMMARY OF RESEARCHES IN SOUND: Conducted in the Service of THE UNITED STATES LIGHT-HOUSE BOARD, by Joseph Henry During the Years 1865 to 1877. GPO. 1879. 104pp. Comprehensive report details the extensive experiments conducted by Prof. Henry in an effort to improve the fog signaling in the United States . Includes details of full size experiments conducted at Block Island, RI., Little Gull Island in Long Island Sound and at various locations in Maine . An important, scarce early work. Well illustrated with diagrams. (Spiral bound photocopy $21.80). 23152a. Champlin, Richard L., SOME GUARDIANS OF THE EAST BAY . pp. 29 – 62. Newport History – Bulletin of the Newport Historical Society. Spring 1971. Excellent article details the history of a number of Rhode Island lighthouses including: Goat Island, Block Island, Dutch Island , Brenton Reef Lightship, Whale Rock Light, Conanicut Light, Gull Rock Light, and Plum Beach Light. Includes numerous excerpts from the keeper’s logs and difficult to find information about the lives of the keepers and the early history. (Photocopy $6.80). All text and illustrations on web site Ó James W. Claflin . 06/10/2015 All rights reserved. Use prohibited without written permission.